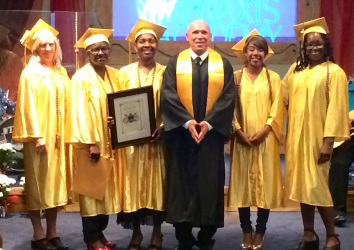 Destiny Ministry Training Center (DMTC) is a 2 year, degree accredited program. We teach the fundamental principles of (and not limited to): the Bible, Christianity, Ministering in the Spirit, Evangelism, Missions and more. We have an hands-on bible school curriculum that is more than a classroom experience - it is a starting point in your quest to help people, and operate in your gifts! Why Should You Attend DMTC? This is real life! There are challenges, joys, and choices to make - including where you will attend bible school for theology, leadership and ministry training. ​Our director and founder, Dr. Larry Matteson, has engineered and originated six (6) bible schools! DMTC is designed to take the learning process further than ever before into the realm of tangible experiences. We aim to pin-point the gifts and callings of each individual into the Art of Action. you will experience unparalleled teaching. We foster an in-depth, cultural, and highly positive learning experience that all students enjoy - with a dedication and promise to help each and every student along the way that will prepare them for the rest of their lives. Our Goal for You is Greatness! Our goal is for you to grasp an individual, personal relationship and perspective of the Father God, his Son Jesus Christ, the beautiful Holy Spirit, and the Holy Bible like never before! We want you to receive all the God has for you, and for you to do all that he has planned for you! Our mission is to prepare each learner and equip them with the tools they need to step out and DO GREAT THINGS in the world! We endeavor to follow through with each of you so that knowledge is gained with application. We want to see YOU - our current and perspective students - living their dream from the moment they step into the classroom. ​God has GREAT and mighty plans for you! Alumni and Post Grad - What's the Difference Please? Great question!! An alumni is a graduate of a recognized affiliate school. A post grad is one who is enrolled in our classes! Any alumni or post grad can monitor (sit in) on any of our classes for a monthly fee. You are gladly invited to join the A.R.C., (Alumni Resource Center) for a yearly fee of $100. That's it! Your A.R.C., membership allows you to sit in as many first and second year courses you desire. If you are an alumni and would like to further your ministry education (with a goal of earning a higher degree), please apply online, or in person (online application located in the 'Praxis' drop-down menu). Post Grad classes are also offered to Alumni at $99 per class - per trimester. Only Post Grad Students are able to take Post Grad Classes. Congratulations graduates for their perseverance and hard work!! You did it!! You can Pay your tuition here! Thank you for your interest in starting, or completing your studies at Destiny Ministry Training Center (DMTC). We are exuberant that you chose our school! Please submit your application today! Complete an application using our online application form (link below). If you like an application mailed to you, please use the contact button to request a copy sent to you. Thank you! Currently, we are not accepting International students. Please join our email list! We'll let you know when our correspondence school is active. ​If you are an alumni of a DMTC or an affiliated school, you can monitor all classes - or 1 or 2 for a small fee. Thank you! DMTC is a fully accredited Bible school. Although DMTC performs the majority of its administration online, a computer is not necessary to enroll. A paper application is available upon request. We use an online registration system because it provides quick, efficient and readily available access for each student to track their work, grades, tuition status and more - on their own time. This method allows students to submit assignments, and communicate with staff and administration online; plan and schedule study group sessions, receive updates and information about school events, extra credit and more! After completion of your 2-year program - with all required attendance, coursework completed - and tuition fees paid, DMTC awards the student an Associate's Degree in Biblical Studies. Looking ahead, we will soon offer Bachelor's Degrees in Biblical Studies and Application, and Master Degrees for those who qualify. For only $100 a year, get invited to exclusive events, updates and mailings.